If you haven’t already done so, read the section above on shin splints. In the leg, there is a series of ‘water-proof’ sheets that run long ways down the leg and divide your leg up into compartments. Each one of these has a certain volume that is the maximum amount of ‘stuff’ that it can hold. Each compartment can hold the normal things like muscles, bone etc. plus a limited amount of fluid. Under certain conditions, if there is an excessive amount of swelling, the compartment becomes comfortably full. If more fluid comes in, it will increase the pressure inside the leg to such an extent that it presses back on the normal tissue, squeezing it very hard and depriving it of blood flow. If this is happening to you, the first thing you need to do is stop exercising. The pain will have made this obvious. See a podiatrist and get some orthotics to reduce tibial muscle strain. Commence exercise again and assess your progress. Occasionally, the fascia that forms the compartment wall may need to be have a little slit cut into it in an operating theatre to allow overflow to leave the compartment and stop the back pressure. This is relatively rare. Almost always, orthotics will solve the problem. 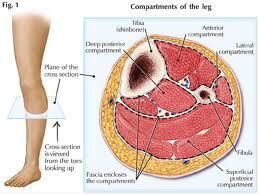 To view this information on compartment syndrome in a downloadable, printable form, please see our Shin Splints Info Sheet. Alternately, use this link to return to the Podiatry FAQs Blog.